Billy Blanks stars in an enjoyable but utterly by-the-numbers action film. Grabit UK R0 DVD. Showdown was intended as nothing more or less than a vehicle for Billy Blanks and Kenn Scott (even down to retaining their first names) and as such the script is a very straight forward affair that could be copied from any number of similar films (particularly Karate Kid (1984)). The outsider in a troubled high school plot is perfectly functional with simple characterisation of good and bad kids at the school, a brief subplot involving Ken's mother trying to find a job never gets in the way of the main story and the secret fight club setting, so beloved of the DTV martial arts films, provides plenty of scope for action scenes. Aside from a few light hearted moments, usually with Ken's geeky friend, the film generally tries for a rather dark tone, although it is hard to take a film seriously that has a full three, completely unironic, montage training sequences. With no real surprises the film is relatively short on action scenes, although the pacing is generally good and it builds enough characterisation to make you root for the hero in the anticipatable combat finalé. Direction, like the storyline, is conventional but gets the job done with the action scenes getting plenty of screentime and smoothly edited. The high school setting is well realised with a plausibly full quota of students and a synthesised soundtrack with plenty of power ballad themes provides suitable backing. Creator of the popular Tae-bo exercise programmes, Billy Blanks is a karate black belt and made a small number of B-movie action films in the 1990s. As in most of his films here, his acting is rather flat but his martial arts talents are used to the fore and he looks as good in the action scenes as any of the major DTV stars. Kenn Scott who plays Ken is obviously trying to make his break here and gives a good show in the combat scenes, but his acting career did not seem to progress any further after this. Christine Taylor who plays Julie went on to more success, being a regular television performer and appearing in a variety of comedy films including Dodgeball (2004). 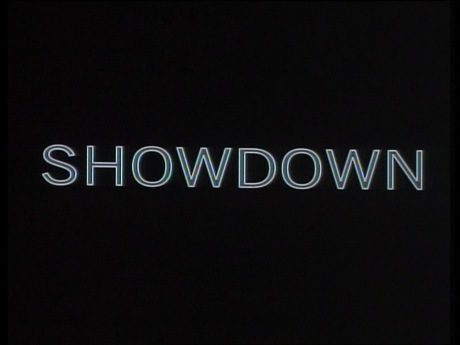 Showdown has a simple storyline and straight forward directing, Billy Blanks can perform in the action scenes but is not a particularly good actor. Fans of straight to video martial arts films will know what to expect and this is a generally enjoyable film but not really worth tracking down. Directed by anyone	interesting? Robert Radler - an American director who has directed a couple of minor films including T.N.T. (1997) starring Olivier Gruner but mostly worked on television projects including kids show Mighty Morphin' Power Rangers. Any gore or violence ? A little blood. Who is it for? Really only for Blanks completists. Visuals Original Aspect Ratio - 1.33:1. Colour. Picture quality is typical of 1990s DTV product, some grain and generally dark but always watchable. Audio English stereo - sounds fine. Bonus trailers for Xtro-3, AWOL, Double Dragon and Blown Away. Other regions? Not currently available on DVD in the US. Cuts? The film is believed to be uncut. Titles and credits are in English. An unoriginal storyline and rather uninspiring direction and acting make this a fair but unrecommendable film. A perfectly good DVD release. All text in this review written by Timothy Young - 1st March 2012.